Travel cooking is something that we have learned a lot about during our world trip and soon we will update this page with plenty more useful ideas to help fill those hungry stomachs at the end of a hard day of cycle touring. In the meantime have a look at these below. A water heating element is not only good for a pot noodle snack, a cup of tea, coffee or cuppa-soup, but it also boils eggs just the way you like them. 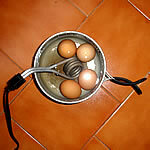 Place the eggs in the pot, fill with water, add the element and let 'em boil. Great if you are feeling like a cooked breakfast, but don't really feel like venturing from your hotel room. With all the camping in the last months and the numerous chances to light an open fire, I thought back to this great fire-starting tip I heard about while cycling in the USA. Soak cotton wool balls in petroleum jelly (commonly known as vaseline), and store in a sturdy ziploc bag. When it comes to starting a fire, pop one of the balls on a stick and place in an optimum position under the wood and light. It will burn long enough to get your firewood properly blazing. 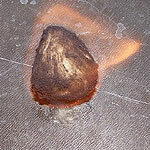 Trouble with a badly burning fuel stove and you have done everything to try and rectify it? Probably due to a built up residue in the lines and places that you can't really get into to clean. And, no matter how many times you prick the fuel hole, it just keeps on clogging up. 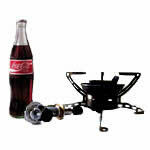 Dismantle the whole stove and immerse everything in Coca Cola (overnight preferably). Before putting back together, wipe clean with a rag and make sure all parts are bone dry. It is probably a good idea, at this stage, to renew your fuel source as well. The problem is often caused by dirty or old petrol. If that's impossible, then filter the fuel through a coffee filter to remove any unwanted bits. 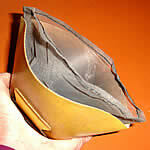 Coffee filters are also useful for putting on the end of your water filter's inlet hose in high sediment areas. It's handy to carry a few with you and they take up hardly any space. 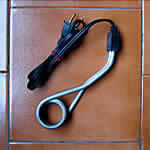 Before we bought our water heating element, there were many moments when I could have killed for a cup of coffee or tea. But let's face it, getting out the multi-fuel stove each time and firing it up, especially when you are not camping, is a real pain in the neck. Well, we no longer have that problem. There are many makes and models of water heating elements and the cheapest on the market go for just a couple of dollars. You can find them in camping stores, travel departments or electrical stores. So, if there is electricity, then you can have boiled water at any time of the day or night. Not only handy for a well deserved cuppa or pot noodle snack, but you can treat the tap water you are not quite sure in a matter of minutes. Not only are they cheap and robust, but they can keep your food warm too. Firstly, in combination with a tea towel-wrapped cooking pot, you can save from two thirds to half the cooking time of pasta and rice. Secondly, used as a base and lid, when making something elaborate like homemade chips or a pile of pancakes, the plates can keep one batch hot while cooking another: especially if you cover them with a tea towel. Furthermore, set next to an open fire they have similar benefits for keeping your tucker at the temperature you like it. Up until Mexico and Central America, we had no problems finding inexpensive unbleached paper filters for our ortlieb coffee holder. From then on in, it was not only difficult sourcing them, but when we did come across them they were bleached and we had to fork out an arm and a leg for a months supply. It was time to figure out an alternative. With some no-see-um (sand-fly) netting left over from tent repairs and using the same measurements as a No 4 cup filter, I sewed together this little addition to our kitchen. As well as weighing and costing us next to nothing, it cleans easily with a good shake and a bit of water. Furthermore, it is way more environmentally friendly. We have mentioned this tip before, but with the rise in popularity of cooking-caddies, we would like to re-iterate one of the many uses of the common 100% cotton teatowel. 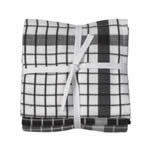 Tea towels can act as an insulator too and we use ours as a cooking caddy. Pasta only needs to be cooked for a third of the cooking time and then wrapped up and left to continue soaking until the sauce is prepared. Rice takes a little longer but performs exactly the same. When camping and staying in colder environments, we also place our enamel plates on the top and bottom for extra insulation. Added benefit here being, it also warms the plates up before serving the meal. So, not only can you use the teatowel for drying your dishes or a picnic cloth for preparing the sandwiches roadside, but it can save on your fuel consumption as well. December 2008: for those that can't live without real coffee! Everyday is a new day and we like to start it with a decent caffeine fix. 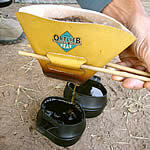 Not being lovers of the instant varieties, we purchased an Ortlieb Coffee Filter Holder early on in our camping career. It is really lightweight, folds completely flat and all you need are No 4 filter papers, a couple of chopsticks and real coffee of course. We can't fault the simplicity of this kitchen addition and we wouldn't be without it. Mmmmm...fresh coffee every morning: one of the little luxuries we just don't want to give up! Okay, you are thinking, what do you need a tea-towel for with all that microfibre out there these days? Well actually, some things are just good the old fashioned way and our cotton tea-towel, a seasoned 6 years old when we left, has remained strong throughout its further 2 year bashing on the road. So, we use it roadside as a picnic cloth, for making sandwiches on or just plain sitting on. It hangs almost permanently from a bungi cord on the back of my bike so it's always accessible and this is how it usually dries as well. Also, when preparing pasta or rice, we cook it halfway through and then wrap the saucepan in the towel for the other half of the cooking (soaking) process and while we get the sauce ready. It keeps the pot piping hot. And then at the end of the day, it works well for drying your dishes as well. The Tupperware FlatOut™ 3-Cup Container has come in so handy during our travels, that we thought we had better share the secret with everyone. 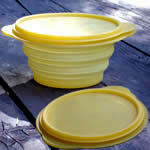 They are expandable airtight containers that flatten to a disc for easy lightweight transport when not in use. There are different sizes but we found the 3-cup (700ml) variety to be the best for us. Being expandable, also means it has three different sizes for storing the left over rice dinner or salad that can be enjoyed the next day while on the road. Just take a look at the storage section on the Tupperware site for more details. Shouldn't be too difficult finding a Tupperware supplier near you. 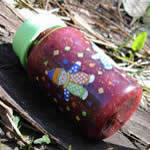 August 2006: for storing liquids, use a baby bottle! If you don't mind clowns and happy faces on your storage bottles, a good, very cheap, and 'super-safe for liquids' alternative is a baby bottle. In the past, I've always used Body Shop containers since the ones at camping stores are always so astronomically priced. But after no success finding an outlet in France I resorted to trying the baby bottle and it's really good. You can also cut the teat off and you have a rubber ring for extra sealing, however it works fine without it.